– Carey McWilliams, “The Evolution of Sugar Hill,” Script, March, 1949: 30. Today West Adams Heights is still obviously something special. The past sixty years, however, have not been kind. In 1963 the Santa Monica Freeway cut through the heart of West Adams Heights, dividing the neighborhood, obscuring its continuity. In the 1970’s the city paved over the red brick streets and removed the ornate street lighting. After the neighborhood’s zoning was changed to a higher density, overzealous developers claimed several mansions for apartment buildings. Despite these challenges, however, “The Heights,” as the area was once known, has managed to regain some of its former elegance. The West Adams Heights tract was laid out in 1902, in what was then a wheat field on the western edge of town. Although the freeway now creates an artificial barrier, the original neighborhood boundaries were Adams Boulevard, La Salle Ave, Washington Boulevard, and Western Avenue. Costly improvements were integrated into the development, such as 75-food wide boulevards (which were some of the first contoured streets not to follow the city grid), lots elevated from the sidewalk, ornate street lighting, and large granite monuments with red-brass electroliers at the entrance to every street. These upgrades increased the lot values, which helped ensure the tract would be an enclave for the elite. The early residents’ were required to sign a detailed restrictive covenant. This hand-written document required property owners to build a “first-class residence,” of at least two stories, costing no less than two-thousand dollars (at a time when a respectable home could be built for a quarter of that amount, including the land), and built no less than thirty-five feet from the property’s primary boundary. Common in early twentieth century, another clause excluded residents from selling or leasing their properties to non-Caucasians. By the mid 1930’s, however, most of the restrictions had expired. Between 1938 and 1945 many prominent African-Americans began to make “The Heights” their home. According to Carey McWilliams, West Adams Heights became known “Far and wide as the famous Sugar Hill section of Los Angeles,” and enjoyed a clear preeminence over Washington’s smart Le Droit Park, St. Louis’s Enright Street, West Philadelphia, Chicago’s Westchester, and Harlem’s fabulous Sugar Hill. West Adams Heights, now also known as Sugar Hill, played a major role in the Civil Rights movement in Los Angeles. In 1938 Norman Houston, president of the Golden State Mutual Life Insurance Company, and an African-American, purchased a home at 2211 South Hobart Boulevard. Legal Action from eight homeowners quickly ensued. During that period, other prominent African-Americans began to make Sugar Hill their home – including actress Hattie McDaniels, dentists John and Vada Summerville, actress Louise Beavers, band leader Johnny Otis, and performers Pearl Baily and Ethel Waters, and many more. On December 6, 1945, the “Sugar Hill Cases” were heard before Judge Thurmond Clark, in LA Superior Court. He made history by become the first judge in America to use the 14th Amendment to disallow the enforcement of covenant race restrictions. The Los Angeles Sentinel quoted Judge Clark: “This court is of the opinion that it is time that [African-Americans] are accorded, without reservations and evasions, the full rights guaranteed them under the 14th Amendment.” Gradually, over the last century people of nearly ever background have made historic West Adams their home. The northern end of West Adams Heights is now protected as part of the Harvard Heights Historic Preservation Overlay Zone (HPOZ). 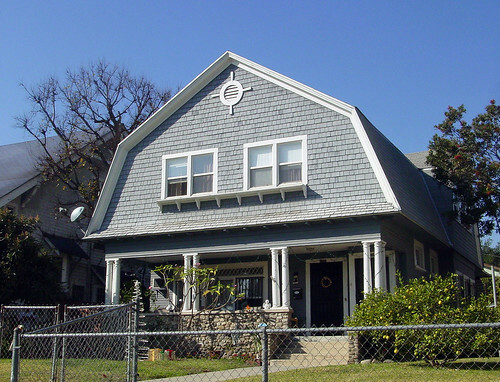 The Historic West Adams area of Los Angeles (which includes West Adams Heights) boasts the highest concentration of turn-of-the-century homes west of the Mississippi, as well as the highest concentration of National Historic Landmarks, National Register of Historic Places, National Historic Districts, State Historic Landmarks, Los Angeles Cultural-Historic Monuments, and Historic Preservation Overlay Zones in the city. The entirety of West Adams Heights should be nominated as a National Register Historic District, for the quality of homes, the prominence of the architects, notoriety of the people who lived in the neighborhood, and the role it played in civil rights. 01 – Harvard Street Monument – Harvard Blvd & Washington Blvd, 1902. Nearly destroyed by neglect and vandals over decades of inner city decay, the Harvard and Hobart Boulevard monuments were restored in 2002. According to the property permit, the house was built for E B Spencer in 1906. Most likely he built this house on speculation (as he did two years earlier at 2039-2041 La Salle Ave), because according to the LA County Tax Assessor’s Office, John A Pirtle purchased this property in 1907. The same year there appears an article in the LA Herald announcing the engagement of Frank Southerland Hutton to Miss Grace Pirtle, who lived with her parents at 1819 S Union Ave, and their plans to build a house in Los Angeles after their honeymoon. Another 1907 article indicates the happy couple were married and moved into their new home on La Salle Ave. But, by 1909, they’ve moved to 1827 S Normandie and John A Pirtle is shown at the La Salle house. John Pirtle was a Southern California industrialist who appears to have made his fortune in the oil fields of Tennessee, Alabama, and Texas, through a company called the Beaumont Exchange and the Oriole Oil Company. He also speculated in water, with the West Los Angeles Water Company, West Side Water Company and the Glendale Consolidated Water Company. Frank Hutton was a well-known and respected Los Angeles lawyer, a partner of the firm Schweitzer and Hutton. This 1907 house is an unassuming looking American Craftsman bungalow, which hides its actual size. Beneath the long, low slung slope of the gable is a rather large house of 2-1/2 stories. The rounded, Colonial Revival styled balcony rail is an unusual feature. Dutch Colonial in West Adams Heights is a rare architectural style, probably already deemed to be passé, but two examples exist nonetheless. The other Dutch is on South Hobart, built for C I D Moore, and is turned on its side, giving it a more Cotswold appearance. This Dutch Colonial is a straight-on interpretation of the vernacular. The architect of the house is reported to be Julius W Krause. Prior to 1895 Krause was partnered with Frank Dale Hudson, of the firm Hudson and Munsell. For a time Krause was also the Superintendent of Building for the City of Los Angeles. The original builder of this house was E B Spencer, however it’s obvious he built it in 1905 on speculation (just as he did two years later the house at 2047 La Salle Ave). This house was quickly sold the same year to Robert K Wilson who Just as quickly flipped it in 1907 to J Frank Waters. Six months later Waters sold the residence to Mark and Mamie (May) E Phelps. The Phelps’s lived at this resident until Mark’s death in 1924. Mark Phelps was described as a pioneer of Los Angeles, first finding success in mining, then as a live-stock dealer. He retired just 3 months before his death. By 1926 J E Phillips who was reported to be living at this address was arrested for smuggling Moonshine Whiskey in his car. In 1943, William J Morris, a building contractor, was the resident, according to his obituary. Wilbur Wells Keim graduated from the Pharmacy School at UC Berkeley in 1902. He married Miss Blanche Lillian Smith in 1903. A large reception for the couple was held at the West Adams Heights mansion of Wesley W Beckett, 2218 S Harvard Blvd. The couple began building their house on La Salle in 1904. Keim opened a pharmacy with Edward R Neill (Keim-Neill Drug Co) just a few blocks away on the Southwest corner of Washington and Normandie, at 1890 W Washington Boulevard. Their daughter, Lorraine Keim was a 1925 graduate of USC and a member of the Kappa Alpha Sorority. The house itself is a mystery. The front porch is Craftsman. The eves under the second story and the overall shape appear to be Colonial Revival. The front door with the half sidelights and smaller window openings suggest an older structure which was moved to this location and remodeled. The effect, unfortunately, isn’t quite successful. Originally the address was 1949 La Salle Ave, but a reorganization of addresses by the city to make them more uniform changed it to 2029 La Salle Ave sometime around 1909-1910. When Frank A Vickery passed away he left a sizable estate. Numerous properties were advertised for auction in the February 28, 2014, issue of The California Outlook, including three in West Adams Heights (1947 La Salle Ave, 2017 La Salle Ave, and 2025 La Salle Ave). Vickery had purchased these unimproved lots in 1906 from the Gopher Land Company as investments and improved the lots. Frank Vickery was a mining industrialist with many interests, including the Pan-American Hardwoods Company in Mexico and the San Gabriel River Rock Company. The Vickery’s lived at 341 Andrews Blvd (S St Andrews Pl), in a 1907 mansion they built for $25,000. According to the LA Times and LA Herald society pages, they entertained often. In May, 1910, the Vickery’s sold their St Andrews Pl home through the Althouse Brothers for $45,000, to Mrs. Frederick Fischer, and relocated to their 2025 La Salle Ave home. After Frank Vickery’s death, auction, either the house didn’t sell at auction or his wide decided to continue living at the residence. The 1923-24 Southwestern Blue Book lists her at this location, with visiting on “Third Wednesdays. “ Mrs. Vickery was also a member of the Ebell and Friday Morning Clubs. Although this house must have been smaller and less opulent than their St Andrews Place residence, it is still a handsome American Craftsman home, with only minor alterations. When Frank A Vickery passed away he left a sizable estate. Numerous properties were advertised for auction in the February 28, 2014, issue of The California Outlook, including three in West Adams Heights (1947 La Salle Ave, 2017 La Salle Ave, and 2025 La Salle Ave). Vickery had purchased these unimproved lots in 1906 from the Gopher Land Company as investments and improved the lots. Frank Vickery was a mining industrialist with many interests, including the Pan-American Hardwoods Company in Mexico and the San Gabriel River Rock Company. The house is American Craftsman, and the architect and builder was the Alfred E Georgian, Co. Imagine this house as it might have been in 1905: the long sloping roof of natural shingles, which would have matched the color of the shingled siding; ornate rails along the porch, widows weep, and above the bay window; a full chimney and no bars on the windows or doors. The effect would have been striking, and will again when the house is one day restored. It’s one of the most significant surviving houses on La Salle. It was designed by the architecture team of Robert Farquar Train and Robert Edmund Williams (Train & Williams), for Pacific Mutual Secretary Stanley F McClung. He was part of the “Old Company” forced out of power in the early 1930’s along with his brother-in-law George Ira Cochran. When Frank A Vickery passed away he left a sizable estate. Numerous properties were advertised for auction in the February 28, 2014, issue of The California Outlook, including three in West Adams Heights (1947 La Salle Ave, 2017 La Salle Ave, and 2025 La Salle Ave). Vickery had purchased these unimproved lots in 1906 from the Gopher Land Company as investments and improved the lots. Frank Vickery was a mining industrialist with many interests, including the Pan-American Hardwoods Company in Mexico and the San Gabriel River Rock Company. The house is a handsome American Craftsman residence, making use of horizontal siding to make it appear wider. This home is American Craftsman designed in 1903 by The Allied Arts Co (as was its neighbor at 1919 La Salle Ave), a prominent architecture firm responsible for many LA landmarks, including the recently restored Hall of Justice. A J Carlson was the contractor. Evan G Evans, from Chicago, IL, arrived in Los Angeles in the late 1990’s, and married Matilee Loeb in 1898. The Mr & Mrs Evans were prominent in the society pages. The second owner, William (Will) Jenkins, was like many of his neighbors, a Capitalist. Jenkins appears to have had his hand in many enterprises, including the Madera Canal & Irrigation Company. Mrs. Jenkins passed away August 5, 1933, at her home at 148 S Irving Blvd, survived by her husband. John H and Wilbur S Tupper were born in Evansville, Wisconsin, the children of John H and Mary Sophia Foster Tupper. In the 1800’s the brothers relocated in San Francisco found themselves in the insurance industry. Wilbur Tupper became Vice-President of Conservative Life and again both brothers moved to Los Angeles. Wilbur was destined for success and after the death of then-president Frederick Hastings Rindge, he became president of both Conservative Life and Pacific Mutual (founded by Leland Stanford). Wilbur’s house was located at 2237 S Harvard Blvd and John’s at 1919 La Salle Ave, within the same tract. In 1906 Wilbur suddenly resigned from the company in scandal involving another woman (not his wife). He fled to Chicago, abandoning his wife and position. His brother John probably suffered for his brother’s indiscretion, which may help explain his sudden departure from the neighborhood and the sale of his house to Thomas M Sloan. About the same time Thomas Sloan had been promoted to Assistant General Freight Agent of the Sante Fe Railroad. This transitional Victorian/Craftsman house was designed in 1903 by the Allied Arts Co, (as was its neighbor at 1929 La Salle Ave), a prominent architecture firm responsible for many LA landmarks, including the recently restored Hall of Justice. A J Carlson was the contractor. A more modest and later addition to the neighborhood, this 1913 Craftsman Bungalow was built for Charles Kraft, Vice-President of the J C Huggins Co, a brokerage and loan company. The home was designed by Architect Earl E Scherich, and May L Greenwood, builder. Between a bicycle shop and a convalescence home are the gates to 1986 W Washington Blvd, which remain the only evidence that a home designed by Hunt & Eager once stood here. Originally commissioned by Mrs. R Fitzpatrick of Pico Blvd, in February of 1905, it was quickly turned over to pioneer Col Charles F Howland, who lived around the corner at 1902 S Harvard Blvd. He attempted to sell it in September, 1905, to Walter Rose, but the deal apparently fell through. In November, 1905, Col Howland successfully sold the home to Roland Paul. When this home was built, Philip Gengembre Hubert, celebrated New York City architect, was listed as the owner. It was most-likely designed by him on speculation. His residence was already established in 1903 at 2144 S Hobart Blvd. Hubert was responsible for designing many New York City landmarks, including the Chelsea Hotel, and after nearly 40 years in practice Hubert retired to Los Angeles, where he died in 1911. This home was sold to Elizabeth L Kenney, the second female to graduate the law department at Stanford University and continued her education at Northwestern University in Chicago. Kenney became the first practicing female attorney in Los Angeles in 1897, entering into practice with her uncle. The house, unfortunately, has been mistreated with a layer of stucco and aluminum windows. We can only hope evidence of the house’s original nature lies underneath. Evidence of how quickly Los Angeles was changing in the early 20th Century can be seen in this attractive commercial block. Nathaniel Dryden, an architect and engineer who built the Brand Library in Glendale and the Robinson Mansion in Beverly Hills, built his home on this corner in 1903. Just 20 years later it had been replaced by a commercial building already. Such was the value of land in the quick-growing city. 18 – Charles Clifford and Belle Case Gibbons Residence – 1915 S Oxford Ave – 1903 – Frank M Tyler. This house, designed by Frank M Tyler, is unusual for the neighborhood because it is completely sheathed in shingles, including the front porch columns. It is a Transitional Victorian/Craftsman in the Shingle Style, with Colonial and Tudor touches. It was built for Charles Clifford Gibbons and Belle Case Gibbons, who came to Los Angeles in 1884. Mr. Gibbons worked his way to from stock boy to general manager of Hale’s Dry Goods Store. His employer, Jas M Hale was a relation of San Francisco’s Hale’s Bros. Department Store, the national chain. C C Gibbons died in 1910 after an illness and in 1912 the house was sold to Matt and Mary Conway. Matt Conway made his business in real estate and land speculation. Coincidentally, the third owner, Jon Fukuto, was also a proprietor of a chain of Los Angeles grocery stores call Jonson’s Supermarkets (the name being a play on words, combining “Jon” and “Sons”). In 1945, after being released from the Gila Internment Camp in Arizona, Mr. Fukuto moved his family to Los Angeles where he established the business.